Our customers can order a complete range of Forklift parts from us, our product portfolio has therefore been extended in order to enable us to offer products installed in Forklift. So, today we supply aside from Cooling system, Power system, Steering system, Break system, Drivetrain system. Hydraulic system, Engine system, Ignition system, we also provide Mast, Fork, Bearing, Filter, Rim Water pump, Gears…etc. We are in the process of establishing a full service concept which incorporates suppliers in marketing and presentation to the world. Besides a well rounded training scheme into which, apart from classic subjects of Own Forklift truck, and the excellent quality of the forklift truck. 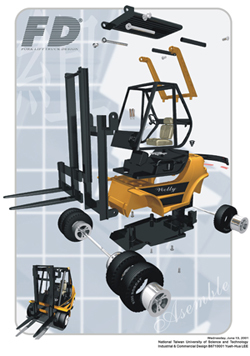 We continue to pursue the extension of the product range for forklift. In parallel we want to come even closer to the ultimate customers by extending our services in the future, acting so to speak as facilitators together with the trade organizations not least through the integration of the Cosmic products will we orient ourselves further in the direction of the workshop trade.